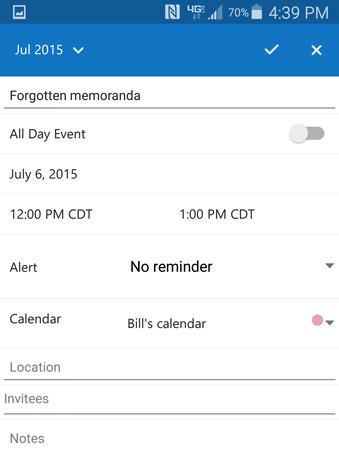 Both versions of the mobile Outlook Calendar feature a prominent plus sign you can tap to open the new appointment form. To set specific details about the appointment you have in mind, tap each line of text on the form to reveal settings for that detail. You can set date, time, location, and more by going through the form and setting each item to what you want. The appointment form is where you record all the details for your calendar. Frankly, if you create a lot of appointments and you have a choice between using desktop Outlook and mobile Outlook, pick the desktop. Mobile Outlook gives you a super handy way to review your calendar when you’re out and about, but it’s a bit cumbersome in the way it leaves you fussing with details that are hard to handle on a mobile device — where you can only use taps and swipes with your finger. When you compare how quickly you can enter an appointment in desktop Outlook with how long it takes to enter one in mobile Outlook, you’ll agree that the desktop version is easier. Remember, though, that mobile apps get updated every month or so, which makes it likely that the process will be much different and simpler by the time you read this.